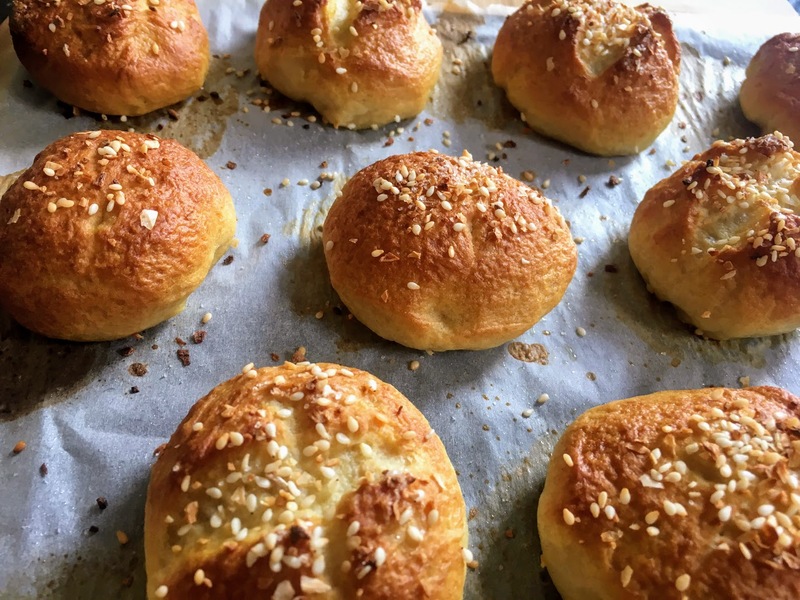 The idea for these flavorful pretzel rolls came to me when I tutored a group of children over the summer. After weeks of providing store-bought pretzels as a snack, I decided to surprise the kids with a homemade treat. I adapted my favorite soft pretzel recipe from Chowhound, and added some “everything” bagel seasonings: dried onion flakes, sesame seeds, and salt. 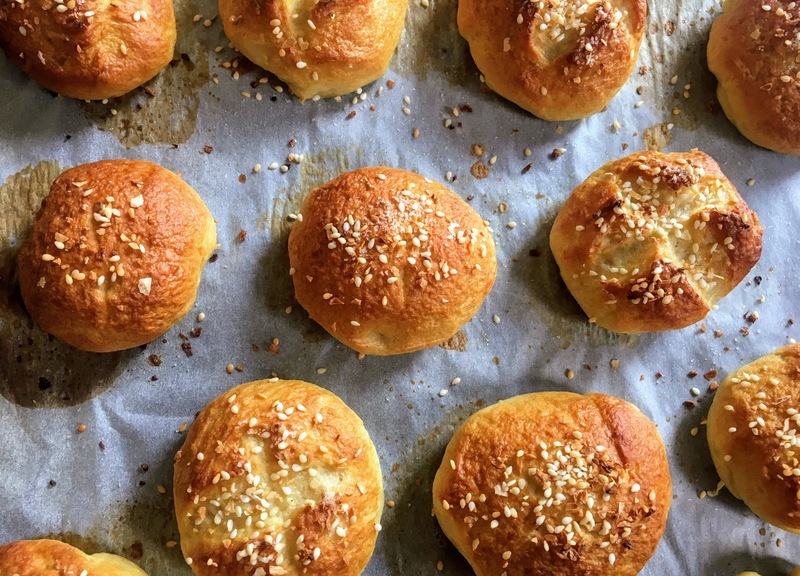 Pretzel rolls, which have roots in Germany, are dunked in boiling water and baking soda before going in the oven, lending them a dark crust and uniquely sour flavor. (Bagels go through a similar boiling process, minus the addition of baking soda.) Despite their initial reservations – “these smell…different!” and “I don’t like onions!” – the kids (and another tutor) gobbled up their rolls and asked for seconds. Nearly the whole batch was gone by the end of class. In a large mixing bowl, combine water, yeast, and sugar, stirring until dissolved. Set aside for a few minutes until fluffy and bubbly. Stir in bread flour and salt until a dough comes together. On a lightly floured work surface, knead dough until smooth, elastic, and springs back when touched. Return to bowl and cover with a towel or plastic wrap. Place in a warm spot, and let rise for 30 minutes. Divide dough into 17 equal-sized pieces. Roll each piece into a ball (for tips on how to shape dough into a tight ball, see this video) and score the surfaces with deep, x-shaped slashes (this allows the bread to release steam in the oven while holding its shape.) Cover with a damp towel and let rise for 15 minutes. Preheat oven to 425 °F. Line a baking sheet with parchment paper and lightly grease the parchment with vegetable oil. In a large saucepan, bring water to a boil, then add baking soda. In two separate batches – 8 in one, 9 in the other – place the rolls top-side down in the water, and let cook for two minutes. Remove with a slotted spoon and transfer to prepared baking sheet. In a small bowl, combine sesame seeds, onion flakes, and salt. (Use more or less salt as desired.) Feel free to add additional everything bagel seasonings, such as poppy seeds and garlic flakes. Sprinkle seasonings evenly over the tops of the rolls. Bake for 10-15 minutes, until deep golden brown. Serve warm. Store at room temperature in an airtight container or plastic Ziploc bag.